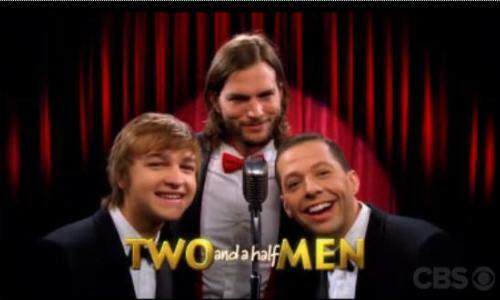 After all the behind the scenes Charlie Sheen drama and Ashton Kutcher recast hype, the Two and a Half Men premiere is just days away. The video of Ashton Kutcher, Jon Cryer and Angus T. Jones “singing” the theme song went viral yesterday. Now SheKnows has a fresh clip of the guys dishing the new season. SheKnows posted the new Two and a Half Men opening yesterday, and the new clip of the guys lip-syncing the show’s theme song went completely viral. This time, CBS takes us onset to hear what Jon Cryer, Angus T. Jones and their new costar Ashton Kutcher have to say about the new season. Check out the sizzle promo below, along with a silly CBS spoof about Bringing in the New Guy just for fun. As anyone not living in a bubble knows, Kutcher joins the cast as Walden Schmidt on the ninth season premiere, airing Monday, Sept. 19 at 9:00. While Charlie Sheen will be getting roasted the same night, word is his Two and a Half Men character Charlie Harper will be getting eulogized. Depressed billionaire Walden comes into the pitcture when he buys the beach front pad — and somehow ends up with one and a half roomates? With so much secrecy and hype surrounding the premiere, anything is possible. SheKnows imagines we may not get a sneak peek clip for Kutcher’s first episode. If we do, however, you can bet we’ll post it, so stay tuned! Two and a Half Men : Courtney Thorne-Smith returns, Ashton’s ex cast!